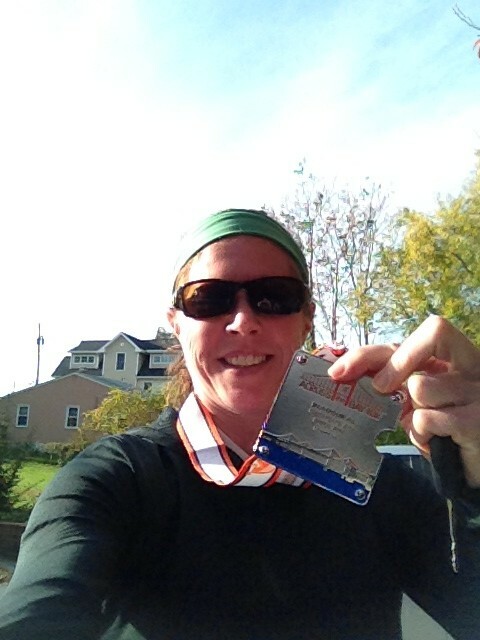 The inaugural Chesapeake Bay Bridge Run, dubbed #10kacrossthebay in social media, was my first race post-baby just one week after she hit the two month mark. I went into it wanting to be able to run a consistent 8:30 pace and was pleasantly surprised to average an 8:00 pace. Albeit, half the race was downhill. The uphill first mile and a half of the race I found to be a nominal incline and not nearly as challenging as I expected it to be. My miles 3-4 and 4-5 were just sub-8s which is a pace I’ve not hit in a LONG time. I was hopeful I could maintain that pace through the finish but I also literally didn’t know what I could do. Halfway through mile 5 I knew I had plenty left in the tank and ran hard to 6 with the intention of pushing it the last .2 miles. Because it was a race, I’m glad I took this approach but it is also clear to me that I’ve got a ways to go before I will have my long distance base built and before I really have consistent speed again. I registered for this race approximately 18 months ago. There was an “early bird” registration deal and all I knew about the race at the time was that it was over the Bay Bridge, an event that hasn’t happened in over 7 years. When I registered I truly didn’t realize that the race wasn’t until 2014 nor did I have plans to have just had a baby prior to the race. From the moment of registration all the way through post-race, I have to say that these organizers pretty much nailed it. Communication was fantastic. Logistics were extremely well coordinated and communicated. A point-to-point race has its fair share of challenges getting runners to the start and back to the start after the finish. But a race over a bridge, with 20,000 runners, within miles from the U.S. Naval Academy, with a high profile and with Boston Marathon race director Dave McGillivray on hand to share his expertise–this kind of race–is no doubt a race organizer’s challenge and victory all at the same time. I absolutely applaud the organizers of this race for what they pulled off. The only less than optimal detail to this race that I must call out is that it was a cup-less race. As a Chesapeake Bay Foundation donor and advocate I totally understand and respect the environmental component of this decision. But as a runner and as someone who has worked water stations, I’m also still not sure I favor this decision. We got lucky today with the weather for sure and to have run the bridge on a day when there was essentially no wind, I couldn’t help but notice that it would have taken truly intentional tosses to get cups over the bridge barriers and into the Bay. I also know people who ran today with this race as their first 10k. I don’t know whether or not they trained carrying their own water but to have your first long distance race without water stops felt a little unfair. There is something about the camaraderie of a water stop. Masses of volunteers, extra cheering, the strategy of running (or walking) through a water stop…to me, water stops are truly part of racing. But the Bay Bridge Run chose to go cup-less. There were “water monsters” on the course where runners could fill up their own water bottles but the lack of true water stops had a slightly anti-climatic feel. I’d be very interested to know other runners’ take on this and whether or not in hindsight the organizers still feel like it was the best decision. I’m just curious. Water stops or not, this race made me feel like I’m back! It gave me the extra mental ‘oomph’ to really start training and to get my winter running plan together. And as I’ve expressed many times before, there is really nothing like racing and the spirit of runners on race day to make me love this more. I love the crazy early mornings, the pre-race routines of runners. I love the pre-race jitters, the adrenalin rush of a finish surge and the feeling of accomplishment after crossing the finish. Thank you Bay Bridge Run team for giving me back racing. This entry was posted in Running on November 9, 2014 by Natalie.